2 pages. 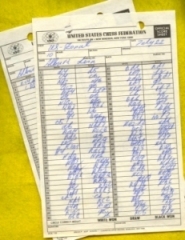 Octavo (8 1/2" x 5 1/2") Original hand written score of the game in round 10 between Lev Alburt (white) and Anatoly Lein in Alburt's hand with the results a 66 move win for Lien. 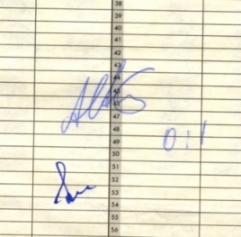 signed by both contestants. Anatoly Yakovlevich Lein (born March 28, 1931, Leningrad) is a Soviet-born American chess grandmaster. FIDE awarded him the International Master title in 1964 and the International Grandmaster title in 1968. He won the 1971 Moscow championship after a play-off. He finished equal first at Moscow 1970, first at Cienfuegos 1972, first at Novi Sad 1972, first at Novi Sad 1973 and equal first at Grand Manan 1984. In 1976 he immigrated to the United States, finishing equal first in the U.S. Open that year. He also played on the 1978 U.S. Olympiad team. He was New Jersey champion 1992-95. 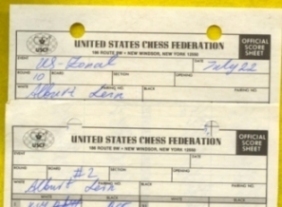 In 2005 Lein was inducted into the World Chess Hall of Fame in Miami.